Merriam-Webster just announced “feminism” as its 2017 Word of the Year. The dictionary publisher has been issuing a list of 10 words that are important or highly-searched during the year since 2003. Other words on this year’s list include complicit, recuse and empathy. The Merriam-Webster dictionary defines feminism as, “the theory of the political, economic, and social equality of the sexes,” but it hasn’t always had that meaning. When the word first showed up in the dictionary in 1841, “feminism” described “the qualities of females.” Feminism was first used in the modern sense in 1895, during the first wave of the political movement the word now describes. Since then, the feminist movement has advocated for women’s rights, such as the right to vote and participate fully in government. The movement also works to advance women’s place in society and to eliminate gender stereotypes that affect women’s careers, legal recourse, health care and more. If this word has been used for well over 100 years, what made it so important in 2017? Many people “think of feminism as a dated movement, because women have achieved so many of our goals and have more freedoms than our predecessors,” says Dr. Jennifer Fuller, Assistant Lecturer of English at Idaho State University at Idaho Falls. But this year, many people have come to terms with the fact that the movement is contemporary and ongoing, instead of something relegated to the past. Internet searches for the word spiked at times when its meaning was in question. As these fights happened on the public stage and were increasingly shared and re-shared on social media, internet searches for the word increased. Google data shows a spike in searches for feminism during and after the Women’s March, a human rights march which took place on January 21, 2017. While some saw it as a strong showing of female political power and solidarity, others disagreed with its core assertion that women are still treated unequally. However, as HuffPost contributor Mycah Hazel observed, Conway speaks and writes about women's issues (such as unequal pay), showing that she is a proponent of many ideals considered to be feminist. Searches spiked around the releases of Hulu’s series “The Handmaid’s Tale” in April, and the film “Wonder Woman” in June. Both stories highlight questions about female agency within society, and women’s roles in the modern world. More recently, spikes occurred around breaking stories of sexual assault and harassment by powerful male figures such as Harvey Weinstein, Kevin Spacey and Al Franken. TIME magazine’s 2017 Person of the Year was the collective group of “the silence breakers”; women who broke their silence as victims of sexual harassment, some of whom used the social media hashtag #MeToo. Merriam-Webster’s choice of feminism as the 2017 Word of the Year reminds us that words–and their expanding definitions in the context of societal change–have a great deal of power. Why is it important to 20 million people if Wonder Woman is a feminist? 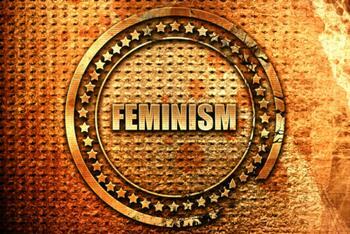 “Feminism isn't just in the big fights,” Fuller says. “It’s also in the daily things that we continue to say to girls and women. As #MeToo showed, women are still facing issues on a daily basis. Now as well as in the past, feminism is our way of calling back that we can and must continue to point out problems as we see them."